Elastic pleated high-low skirt. There are two fabrics the under skirt is denim, and come just below the knee. 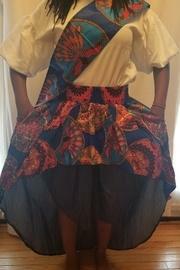 The outer layer represents the high low, and it is African Like fabric. The skirt is very full, fits small to large. The optional fabric can be word as a head band or waist rap.